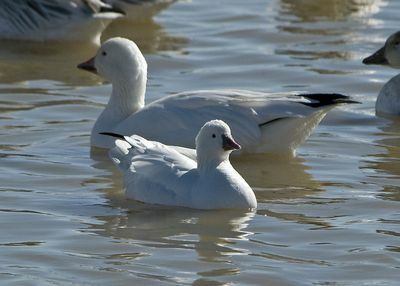 The food of the snow goose is largely vegetable, in fact almost wholly so during the greater part of its sojourn in its winter home. Various kinds of ordinary grass form a large part of this bird’s food, at least during their winter residence in the United States. Snow geese dispense shrill falsetto cries as they fly about in companies of their own kind, or else mingle sociably with other species. The snow goose, although it plays a less conspicuous part in the interior of the country, where it seldom alights, becomes the first and greatest object of sport after the flocks alight in James Bay. The havoc spread throughout their ranks increases as the season advances and their crowds thicken.